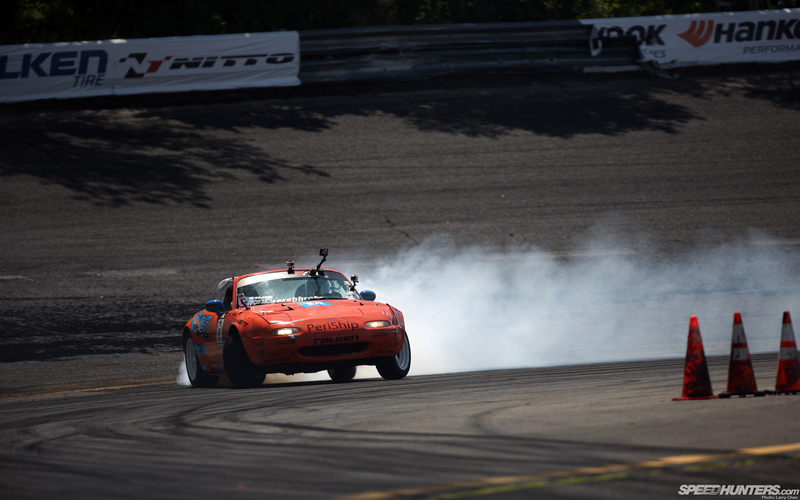 Danny George just finished his rookie year in Formula Drift, and he did it in a Mazda Miata. 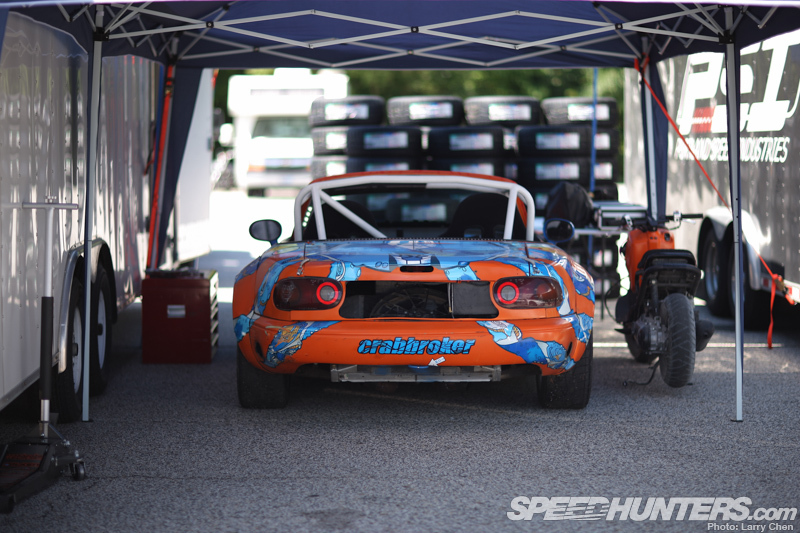 Many have tried to drift it but few have succeeded, but we all knew it’s the little roadster that could. 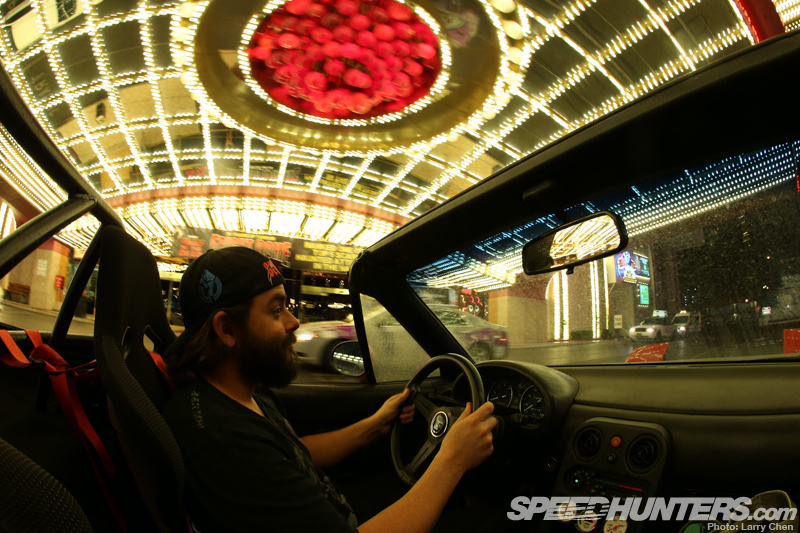 I met up with him at SEMA to see what he’s all about. 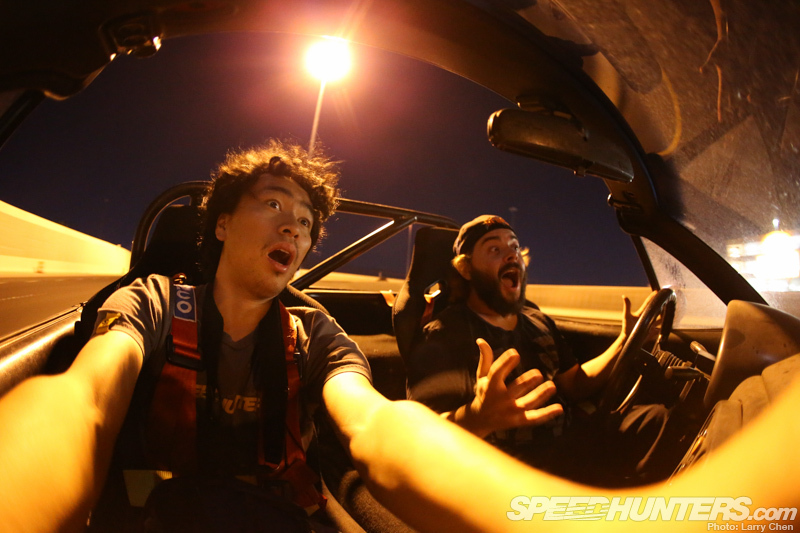 Larry: You were really emotional when you won the ‘spirit of drifting’ award at this year’s Formula Drift awards banquet. Why did that carbon fiber plaque mean so much to you? 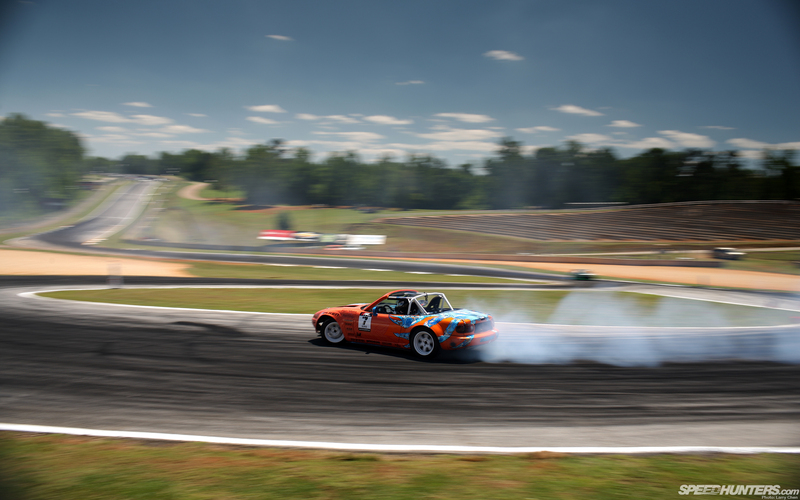 Danny: Winning the Spirit of Drift was probably the #1 goal for me this year. 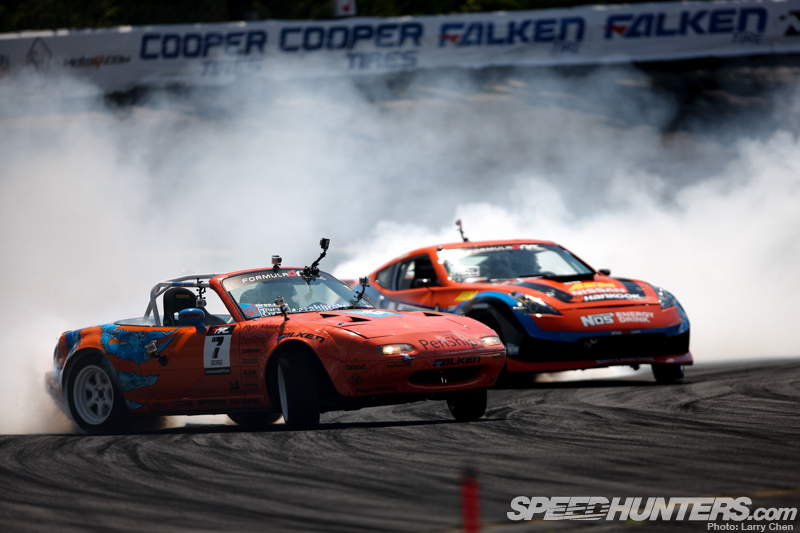 Before the season started we knew the Miata was underdeveloped, we knew our team was fresh, we knew the talent that we were going up against; winning was never a forefront thought for us. 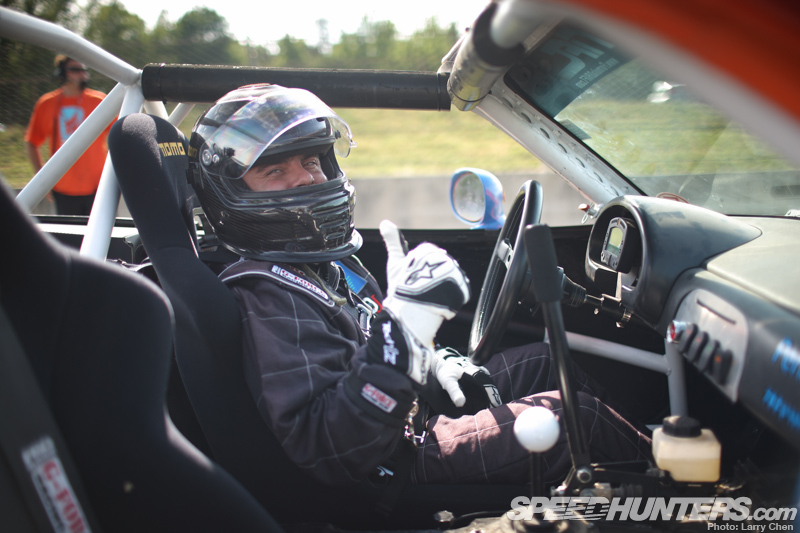 It was mainly, go qualify and blow it up… having fun, which I think that spirit of drifting award embodies. I think that is such a refreshing thing for us because that was our goal all year – have a lot of fun, travel, build relationships within the team, and be good to the fans. 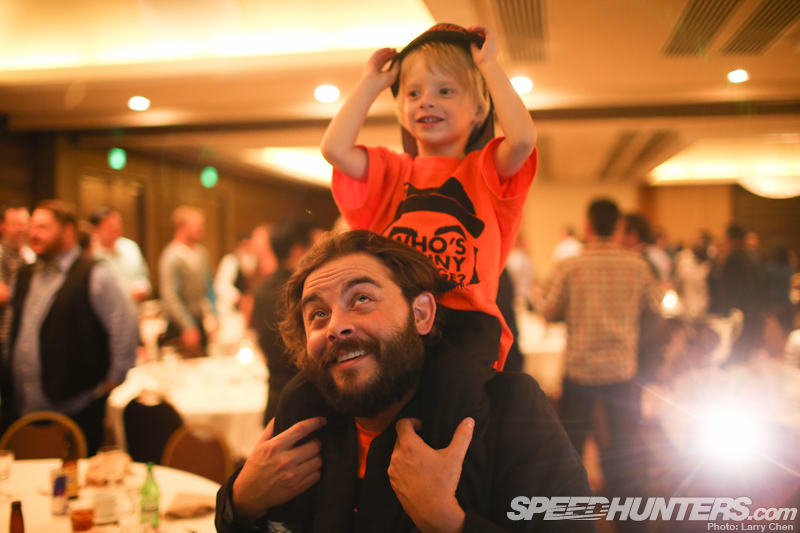 We try to interact with the people when I go to a racetrack… When I was a kid, if I had the opportunity to meet a driver and then get invited to sit in a car and start the car … or just have more presence there to be able to blow some minds of kids and fans. That was our big thing, to try and be more personable and open pit-wise, to everyone as we could. Larry: Yeah, because maybe to little kids, they don’t know if you’re the top driver. In their eyes you’re just a race-car driver and basically they’re meeting an idol, someone they want to become later on in life. Danny: Yeah, ’cause when you go to a race track when you’re a kid, all you’re thinking is you want to be a race-car driver when you’re older. That was when I went to Indy car and watched Michael and Mario Andretti, those were the dudes where I was like, “I want to be a race-car driver when I grow up.” And going and meeting those dudes when we were young, that was uh, you know I can still remember the first time I went to the Canepa dealership in Santa Cruz and Bruce Canepa was there that day and he let me sit in a Countach. Back then it blew my mind, still remember it ’til this day. And to have that opportunity to have a child that wants to be that when they grow up, to then jump up and take that kid to a whole new level is the greatest cool thing. Especially being a dad ’cause you can see how excited they get out of nothing so that was a great opportunity for us. 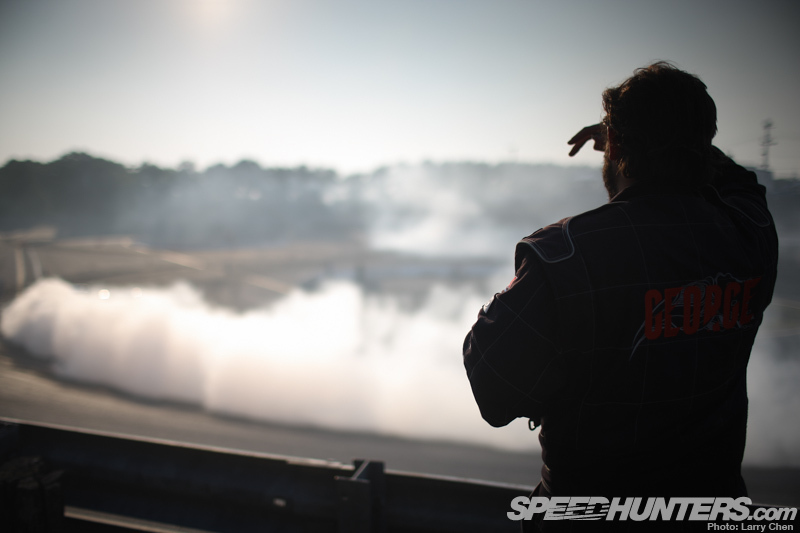 Larry: I guess that’s the good thing about drifting where it’s big enough you have that fan base but it’s still small enough where you can be one-on-one with your fans still. 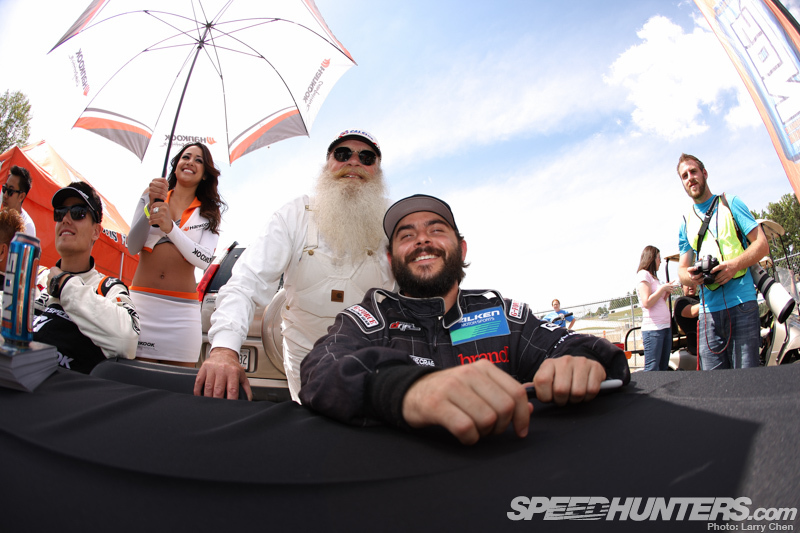 Danny: Yeah the Formula Drift open pit policy where every person who gets a ticket can then go up, touch the car, sit in the car, meet the driver, meet the team, is a great experience for a family. Then if you can take it to that next step and take it beyond just walking by and seeing a car, is such a great opportunity and such a pleasure for everybody on the team to be able to interact with those people. Larry: So you may not have gotten the results you wanted. You got your three top 32 qualifiers, so winning that award really made it all worth it, huh? Danny: Absolutely. We did three qualifiers out of the seven. 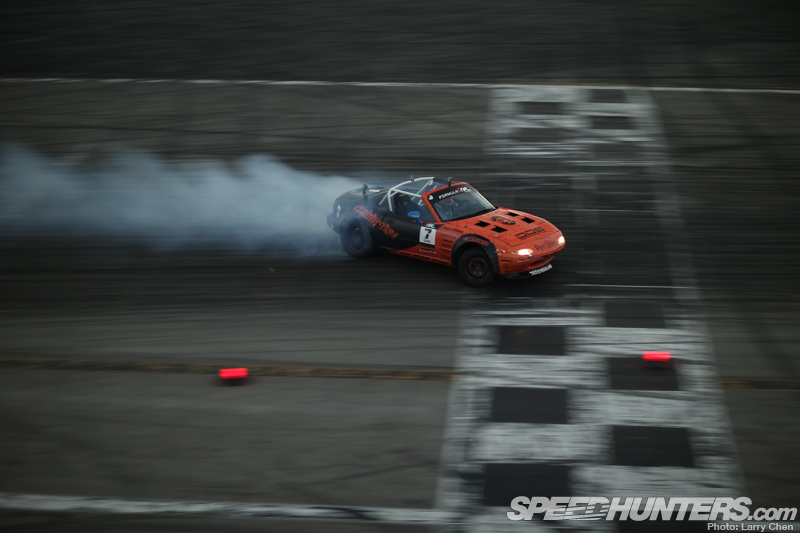 Long Beach was the track to be an epic run of our first qualifier and it probably would have been a top ten run. First run out, and it would have been sick, ran out of gas. Palm Beach was super close, we were like 34th, again very close, and Irwindale was kind of the only one, other than Seattle crashing in qualifying. Overall I think the season went well. We had the chance to do really well, it’s just a couple of things didn’t work out. But again, it’s not about winning at this point of the game for us. It’s not even a thought really. 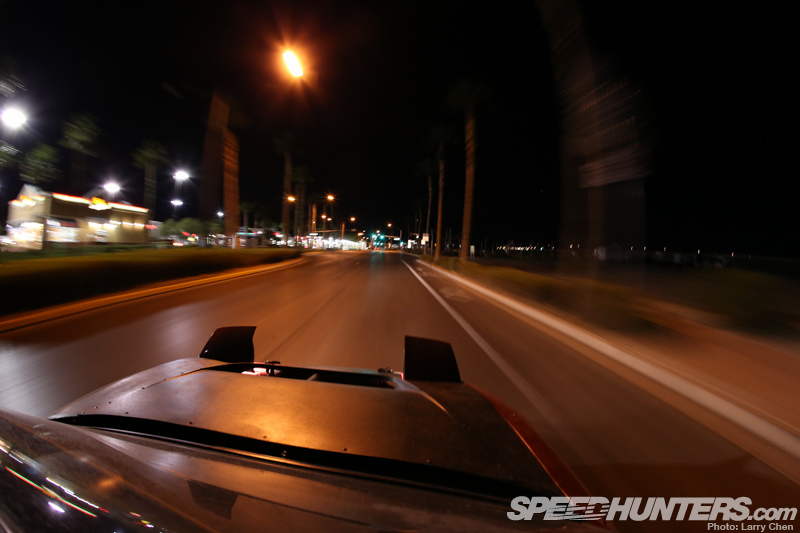 Drifting brought us to this having fun and just going out and doing what we like to do and that is get sideways. Now at this level it’s a lot more challenging because of the course layouts. It’s not about winning man, it’s about the experience and the journey and the passion and just the dream of being out there, being race-car drivers, and having this opportunity. Larry: It’s Miata week and everyone is tuning in because your fans are Miata owners. Why are you in a Miata? Why stick with this platform? Danny: I’ve had numerous dudes, especially over the last month after the season’s been over, go ‘Hey Dan, you got some skills, get into another chassis and you can kill it. Do anything else other than a Miata. The Miata cannot do drift at this level.’ And maybe it’s being stubborn, maybe it’s knowing something in the back of my head that I know the weak points of the Miata, I know what we need to do to get there, and we’re so close, we’re just a few things away from getting that chassis just right there. 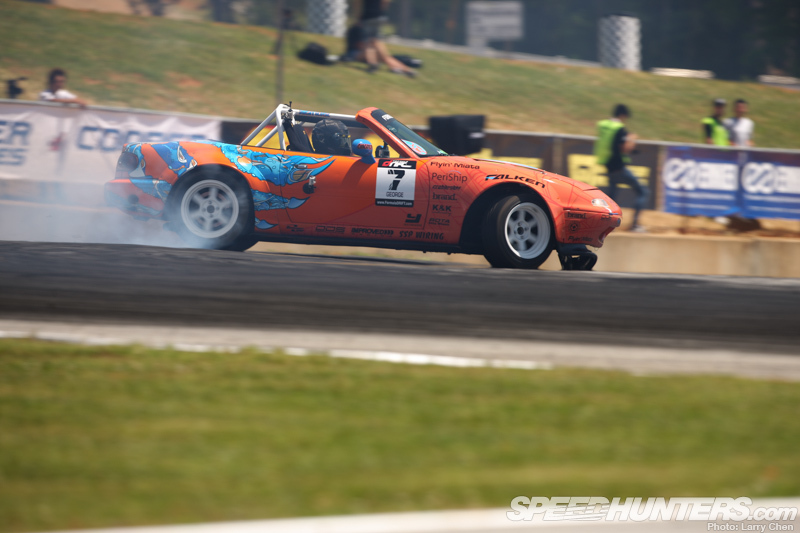 It might not win, it might not be a super top car, but it’s the baddest chassis to drive – daily, stock, modified, drift, grip, I mean it’s a convertible! 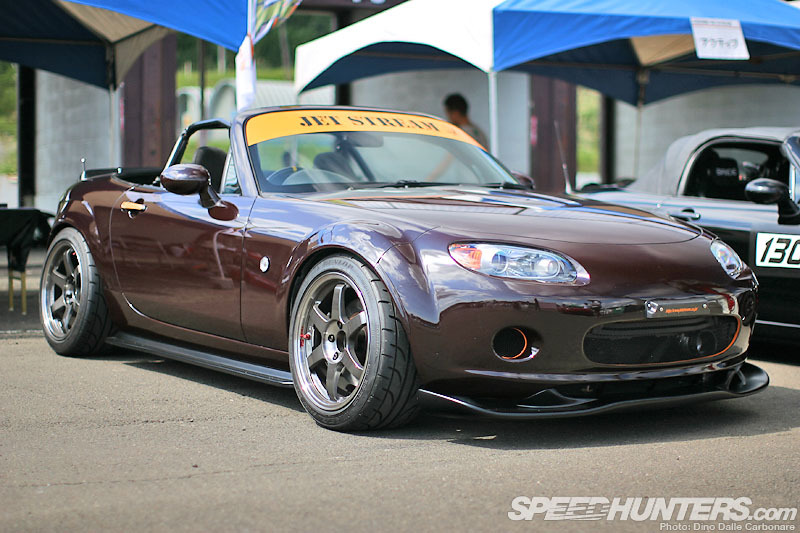 It’s so unique and small, and nimble and light, and just awesome that I’m just a super die-hard Miata guy. And anybody that I know that has driven them, you know, you get out of the car and you’re smiling. 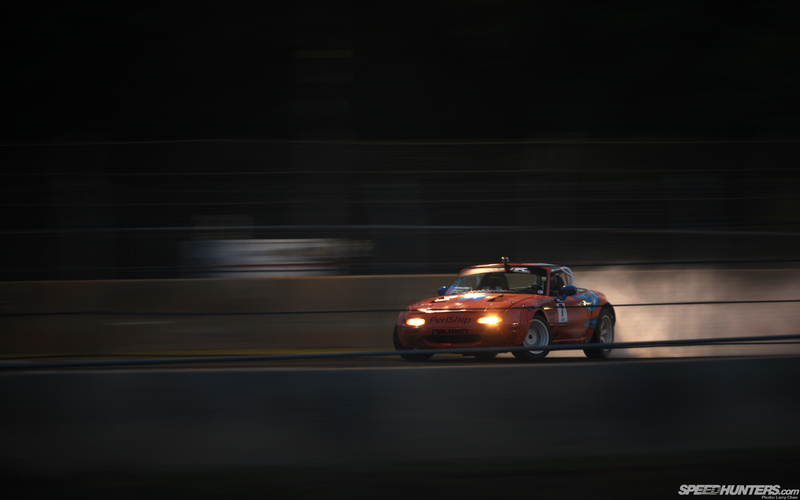 At the end of not qualifying, you get out of the car and you’re a little bummed, but it’s such a fun experience driving the Miata, trying to do something different. I don’t want to be a sheep in a 240 and have to conform to that. 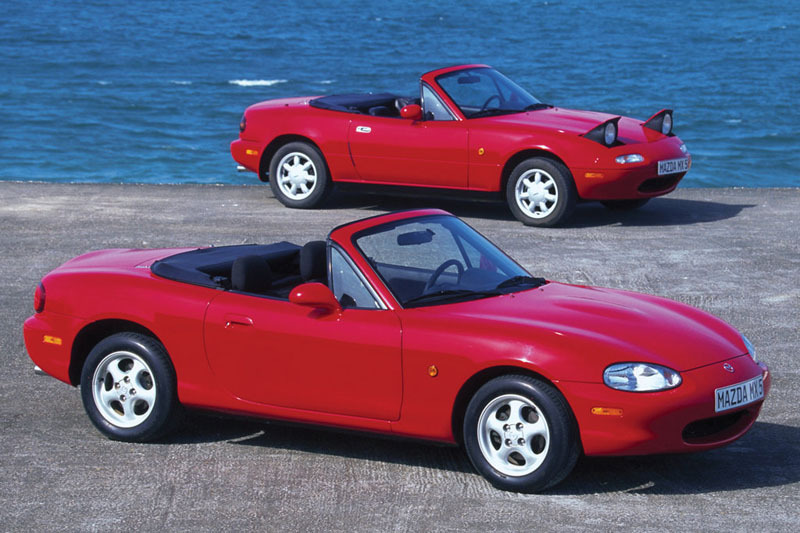 I’m not going to do it, I can’t do it, and I want to be the guy that either went down in history as I proved that with the Miata there’s no chance getting there, or on the flip side I took it as far as I possibly could. It’s never been in the top 16 before, I want to be the guy that changes the game and puts the Miata somewhere that it’s never been. It’s the baddest chassis ever and I’m riding it ’til the wheels fall off or lightning strikes, whatever comes first. Larry: Alright, that’s really good. So what sort of plans do you have for your car for next year? 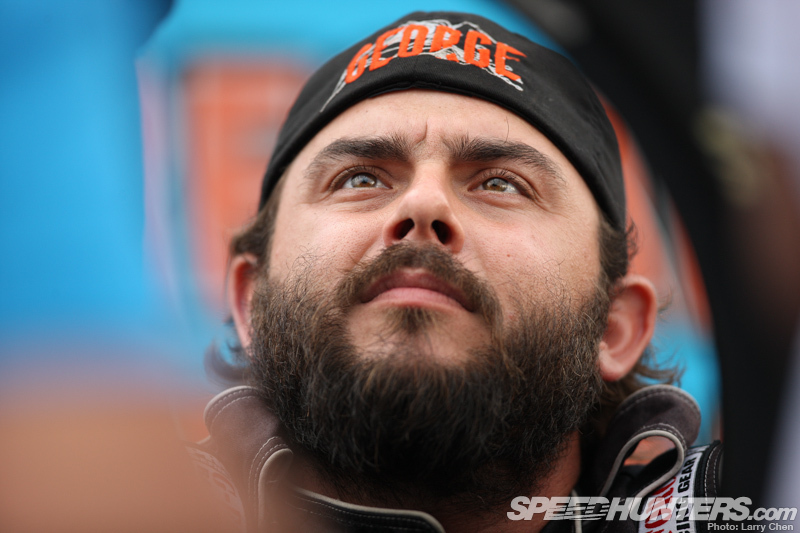 Danny: At this point right now you’re catching us on SEMA week and there’s some stuff on the table. At this point nothing is set in stone. Larry: What would you like? Danny: If I had three wishes, would be a good family style sponsorship aspect. But what the car needs, it needs power. We tested it with a lot of things and basically 80% of the issues that we are having with the car – spinning, not having enough power, it comes back to power, tire grip, etc. We’re a little overweight so need to lighten the car. We have the grip at our hands, we just have to set the car up for it for when it’s ready. But we just don’t have the power for it to be able to utilize that. So power will get rid of it, lighten up the chassis, and seat time at this point. Danny: I’m super confident that we have come out with the right attitude that we have, and people back behind us with our crew, and sponsors, that the Miata can shake some heads and do some work out there. Larry: Thanks for your time Danny, we are all rooting for you. After the interview Danny took me for a ride in his turbo street car, and you know what? It was awesome. There was a big smile on my face for sure. And with that, we can conclude our Roadster Festival. We hope you enjoyed it as much as we did putting it together! 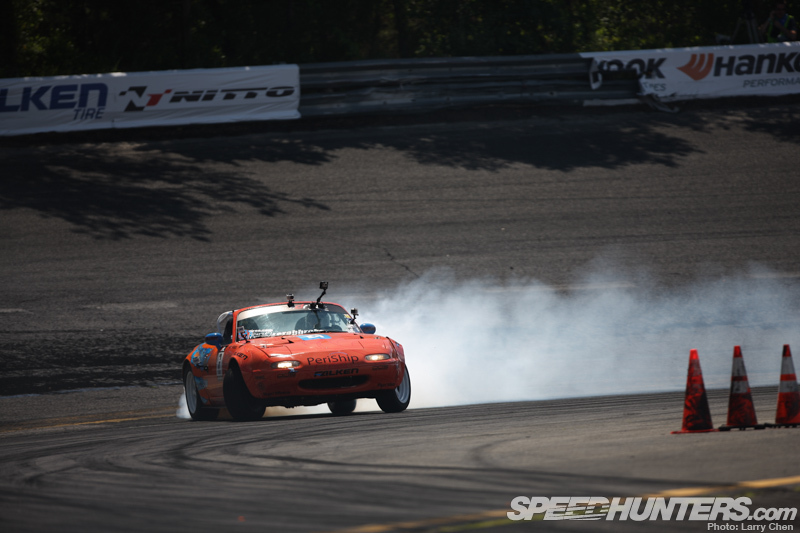 Danny George is the raddest dude in drifting since ever. I've always had so much respect for Danny after meeting him. First of all. Amazing job Larry on the pics, having the best capturing moments like these in my life are truely spectacular. Can't say with words how lucky I feel. Going to my first ASB with a dream of a single pic posted here, now a feature. I have made it! I started to read all of this out loud to my girl and son and matched with the pics I got overwhelmed with happiness. I had to stop and wipe my face. 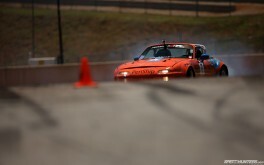 If this was the last season I run FD I will have fulfilled every dream as a racer. Follow your passion and happiness is around the corner. What a way to end the season! Thanks everyone who helped us get to this point! Big or small! Jordan and 666 thank you so much. We are doing are best to make sure we stay driving. Dekro I smashed the wall in Seattle and smoked half the crab. Reprinting , with new flares ect just wasn't doable at the time. I like change, i liked em both. Great read! Good stuff Danny and good luck in the future! Good to see brand loyalty and determination to prove a point. Its not stubbornness because you have faith in your car you just need the opportunity a.k.a money to do it. You got the right award my friend. Looks like FD gave the award to a truly deserving winner! Well done Danny! Great write up and pics as ever Larry. Best of luck in the new season guys :). Hate to be nagging one but why Danny isn't wearing seatbelt? It hurts pretty damn much when hitting head to steering wheel even at low speed... Nice job anyway! @M4nn3 Hrm, I think he had his lap belt on. @Robo_No1 Thanks! Danny is one of a kind for sure.